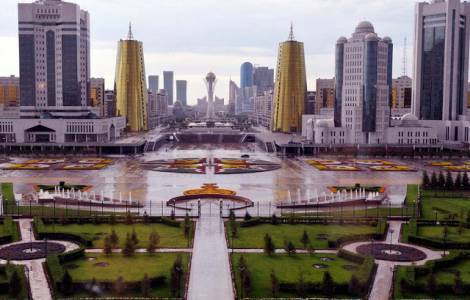 ASIA/KAZAKHSTAN - Nazarbayev resigns: "Religious freedom one of his flagships"
Astana (Agenzia Fides) - "I do not believe that the sudden resignation of Nursultan Nazarbayev can bring great upheaval in the situation of religious freedom in Kazakhstan: outgoing president considered the freedom of churches and religions as one of his flagships. It is, however, a freedom of worship placed under strict control, for fear of the growth of Islamic fundamentalist groups. Probably, Kassym-Jomart Tokayev, Nazarbayev's successor will continue on the same path: I do not believe that religious politics changes because the new leader is of Chinese formation and the Chinese approach is that of a control of religions ". This is what Fr. Edoardo Canetta, a missionary in Kazakhstan in the role of priest and university professor for 20 years, now a professor at the Ambrosiana Academy in Milan, commenting on the sudden resignation of the role of President of Kazakhstan by Nursultan Nazarbayev, at the head of the country since 1990. "Takaev studied in Beijing. I got to know him personally and I consider him a very skilled person. He was deeply hurt in 2001, following the attack of the Twin Towers, because, as Minister of Foreign Affairs, he had opened a dialogue with the Taliban, who at the time ruled Afghanistan, starting negotiations for their diplomatic recognition. This choice cost him a price after the attack", recalls Fr. Canetta, who adds: "I always thought that Takaev could be the new leader of the country, because on the one hand he is a president's man; on the other he has his own visibility: he is the person who signed a very important and famous treaty for the Kazakhs, that of the borders with China". Speaking of the outgoing leader, Fr. Canetta notes: "On Nazarbayev, I can say that he made this intelligent choice on the basis of what happened in Uzbekistan: when Karimov died, his family was impeached. The problem is that at the moment in Kazakhstan there continues to be no real opposition in the government", says Fr. Canetta. Meanwhile, while the Kazakh parliament has approved the change of the capital's name from Astana to Nursultan, in honor of the outgoing president, the country is going through a phase of economic crisis due to the fall in oil prices.